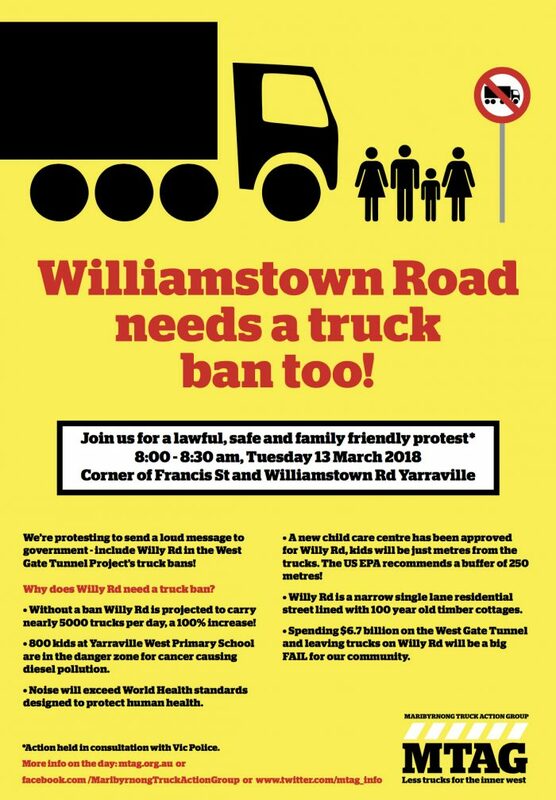 Join us for a lawful, safe and family friendly protest to send a loud message to government – include Williamstown Rd in the West Gate Tunnel Project’s truck bans! MTAG are calling for truck bans for Williamstown Road to be included in the suite of bans that will come into force with the opening of the West Gate Tunnel Project in 2022. Currently these bans include Francis Street, Somerville Road, Buckley Street and Moore Streets in the City of Maribyrnong. Without bans Williamstown Road is expected to have a 100% increase in truck numbers by 2030, this would see around 5,000 trucks using this residential street every day. Williamstown Road is NOT an appropriate truck route. It’s a residential street, running through Yarraville, Seddon and Kingsville, that already experiences an unjust number of trucks. It pretty much a single lane road for the majority of its length, when parked cars are taken into account. It was never designed as a freight route, being over 100 years old. The heritage wooden houses that are situated on it have very little set back from the road. Residents already experience noise levels above those that the World Health Organisation consider are harmful to human health. As well as the detrimental impacts on residents, one of the inner west’s busiest primary schools in located close by. Yarraville West Primary School utilises the Yarraville Oval on Williamstown Road as its main recreational field. Over 800 students at Yarraville West Primary School are already in the danger zone for cancer causing diesel pollution from trucks on Williamstown Road. The City of Maribyrnong has Victoria’s highest hospital admission rates for kids with respiratory ailments. And our asthma rates are around 50% above the state average. Why? Because of the trucks and their diesel exhaust pollution. And this wasn’t enough of a concern, a new child care centre has been approved for the old petrol station site of the corner of Williamstown Road and Francis Street. If we were in California the regulations would not permit this. Their standards there are for a minimum 250 metre buffer from any major freight routes to a new child focused facility such as child care or a school. Ours will have the width of a footpath, approx. 1.8 metres buffer from the trucks. MTAG does not protest often. In our 12-year history this will be our sixth road blockade. It’s a huge under taking for us to do this. But we know that governments and industry take notice when we do. It’s only been community action that has seen curfews introduced on Francis Street, Somerville and Moore Streets. 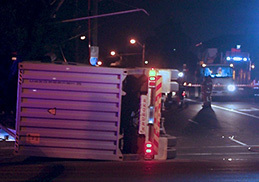 Without community protest we would have no protections from the 22,000 trucks using the streets of Maribyrnong each day. The West Gate Tunnel Project is estimated to remove up to 9,000 trucks from City of Maribyrnong streets every day. But this will only be achieved with truck bans that force the freight industry to use the new toll road. Williamstown Road must be included in these bans. Otherwise it will become the new Francis Street, a disgusting and inappropriate truck sewer that impacts on the lives of thousands of people. There are a range of solutions to stop north/south roads such as Williamstown Rd and Millers Rd being major freight routes. These include upgrading Grieve Parade, forcing it to become the main freeway link for trucks accessing the container yards in Brooklyn and Tottenham as well as moving some of those container yards to the old Footscray Market site. This will be a family friendly action, held in consultation with Footscray Police. Please join us to send a clear message to the Andrew’s Government. Include Williamstown Road in the West Gate Tunnel Project’s truck bans! 1 response to "PROTEST ACTION: Williamstown Rd Needs Truck Bans Too!" It is not only the people whose houses are on Williamstown Road who breathe the toxic fumes in and hear the constant noise from the trucks. Our house is on a small street off Williamstown Road. The current level of traffic is a nightmare, any increase will be unbearable. What also has to be figured in to the equation is the constant stream of trucks which travel along Williamstown Road during the supposed truck curfew. The trucks from Cement Australia are a constant offender. While we pay residential rates for our houses, we live in an Industrial traffic zone. We are sick of being treated as second class citizens.